Framed by moss-flecked sandstone blocks and fronting a picturesque forest waterfall, the Tenino Quarry Pool looks like a lush resort escape. That is, until the gates open and families from all over the Northwest spill onto the scene, arranging towels on the grassy shore, taking a cooling dip or plunging from the diving board into the famously deep, silky water. The quarry swimming pool opens for the season Saturday, June 30. Tenino is a town located about 25 minutes south of Olympia or about a 90-minute drive from Seattle. The pool is actually a natural lake, according to Tenino's mayor, Wayne Fournier. There are even fish, he says, but they’re usually well below swimming level and rarely noticeable. Formed at the site of a working sandstone quarry established in the late 1800s, the pool is a “priceless piece of local history,” says Fournier. 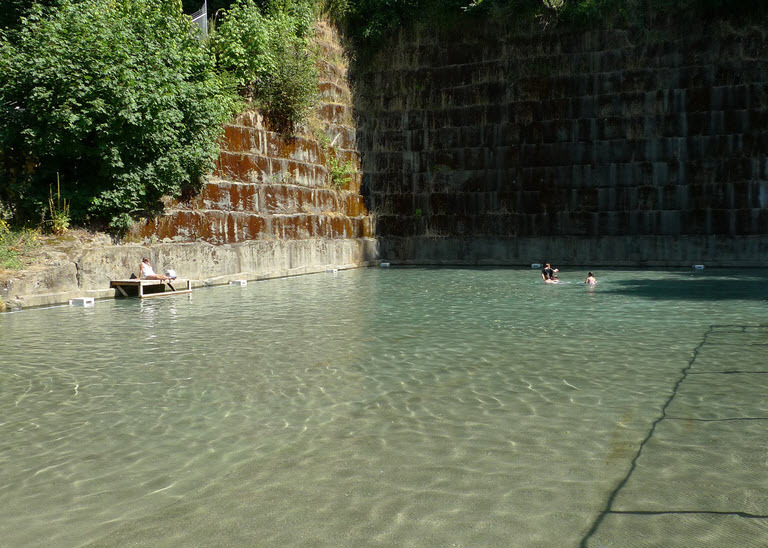 After the quarry ceased operations in the 1920s, the 100-foot well filled with springwater, creating a deep natural reservoir perfect for a summer dip. In the mid-1940s, the city converted the site to a public pool. To accommodate guests of all ages, the pool has two sides, separated by a fence: A shallow, chlorinated, crystal-clear wading pool for tots on one side (three feet deep), and a big-kid-only “deep” side that isn’t chlorinated or chemically treated. Swimmers must pass a swimming test in order to swim on the deep side — no exceptions — and a handful of lifeguards on are on duty at all times to put safety-minded parents (raising my hand) at ease. Visitors are welcome to bring in outside food, and can come and go during operating hours — so families can swim for a bit, leave for lunch and shopping in Tenino, then return later. Toys, floaties and other playthings are welcome. The number of poolgoers can swell to 700 per day on hot days, says Fournier, but there’s plenty of space for visitors to spread out and enjoy this man-made natural wonder. Any cons? The biggest is the chill factor: The water is historically cold, with a typical temperature of 50–54 degrees on the deep side. Swimmers expecting a clear pool may be put off by the deep side's inky blackness — attributed to the quarry’s depth, not the water’s actual clarity. Also, the pool is only open seasonally, June 30–Sept. 2 for 2018) and not every day of the week (Wednesday–Sunday, noon–6 p.m.) Plan your visit soon! As far as age recommendation: The deep side is for strong swimmers only and best for ages 10 and up, depending on swimming skill. The wading pool is appropriate for all ages. Come early to snag a shady spot in the wooden shelter that faces the water on the wading pool side; there are no chairs onsite, so bring your camping chairs or stadium seats for comfy lounging. The Tenino Depot Museum (next to the quarry pool), free and open weekends from noon–4 p.m., is a former working train depot full of local history, including an authentic period washing machine, clothing and accessories from the 1930s and '40s, and a press used to make wooden currency during the Great Depression. The Ticknor Schoolhouse, also open weekends, is an authentic schoolhouse filled with period furnishings, available for tours. Hours: The pool is open for the 2018 summer season June 30–Sept. 2, Wednesday–Sunday, noon–6 p.m. Note: Open hours and days can vary due to weather, lifeguard staffing and other factors. If planning a visit from out of town, call ahead to 360-264-2368 to confirm the pool hours for the current day. Cost: $3 per day for Tenino residents; $5 per day for non-residents (cash only). Punch cards and season passes are available. Events: The Tenino Quarry House, adjacent to the Quarry Pool, is available to rent for parties and events. Fuel up: The Sandstone Café is a local favorite for breakfast and brunch at 273 Sussex Ave. W., Tenino, WA 98589. Editor's note: This article was originally published in 2016 and updated for 2018.